Tarek Chemaly: Kafa goes back to another distressing ad right before Christmas season. 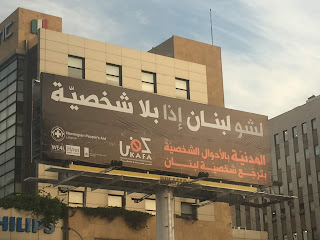 Kafa goes back to another distressing ad right before Christmas season. So how does one write such a post without opening the floodgates of incomprehension? Whereas I applaud organizations such as Kafa for the work they do on the ground, I am a little bit skeptical as to their media strategy. Morrissey once said about the hit song "Do They Know It's Chrstimas Time?" - "One can have great concern for the people of Ethiopia, but it's another thing to inflict daily torture on the people of Great Britain". Unfortunately, Kafa are bordering on that territory. If I am describing this setting, it is necessarily because - and again how do I say that without appearing a bigot? - I think Kafa are doing a disservice to themselves with the media strategy they chose. Since last July, there were dozens of campaigns signed by them. Yes, they scored legal victories, unfortunately, they are now at the over-exposure stage. This sadly where the #metoo movement has headed - what started as a wave of women accusing powerful men of sexual acts against them now is more like "oh it's another one of those stories, what else is on the news?". And this unfortunately where Kafa have reached - another image of a distressed woman with a black background, another hashtag presumably to fuel interest and social media sharing, another set of logos from international partners. And several campaigns one on top of the other. Even as someone heavily interested in media, I lost track of what Kafa are claiming today, I had to look at the ads several times in order not to confuse them with the now kaput 522 law.